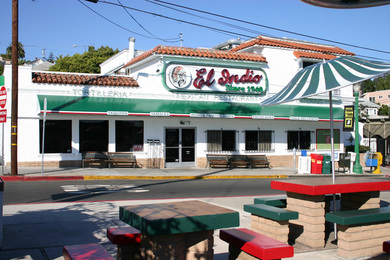 Craving Mexican food for lunch, I suggested to Chuck that we head over to a favorite place over in the South Mission Hills neighborhood of San Diego, El Indio. Usually Chuck balks at my ideas, but not when it comes to that place. There is always a line, no matter what time of day, but it is always worth it. I got the #23, the chile relleno & beef taco combo platter; Chuck chose the #3, 2 chicken enchiladas with rice and beans. El Indio’s tortilla chips are deadly. The size of pig’s ears, they are fried to perfection and dusted with salt and paprika. We always have these chips at our tequila bar we set up for our annual Christmas Open House. For me to hope there will be leftovers from the party is only setting myself up for disappointment. Chuck and I chose a table outside, and there we ate our lunch in the cool autumn air. Chile rellenos are to me, the ultimate Mexican comfort food. I make them once in a while — maybe once a year? — and when I do, I make a couple dozen, then eat them breakfast lunch and dinner until they’re gone. That’s why I don’t make them that often. I tend to judge Mexican restaurants on their rice, and El Indio doesn’t disappoint. Their refried beans are nothing out of the ordinary, but they make a great dip for those fabulous, dangerous chips. What is it about good Mexican food that makes it so hard to stop eating when you get full? The combination of melted cheese, spiciness and sauce warms my soul, yet hinders my good judgement; I am always uncomfortable afterwards. Oh well, as much as I should be taking a 5-mile walk to help my digestion, I prefer a nice siesta instead. Besides, it looks like rain will be hitting soon.